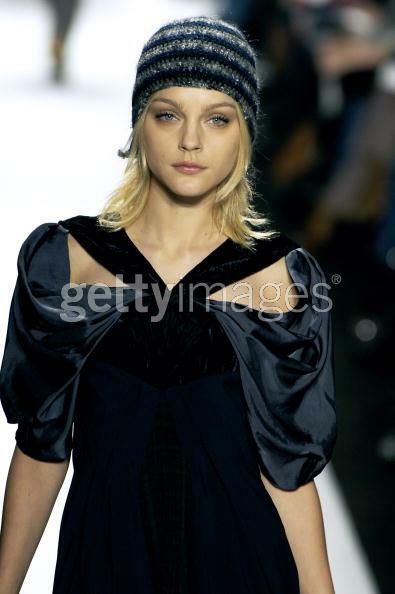 Jessica Stam may be the most beautiful woman alive today! Well, I think so anyway! And frankly, the combination of my favourite model with my favourite clothing label (BCBG MaxAzria) makes for my idea of pure heaven on a runway! One of my favourite things to do as a cook is to try and concoct a wonderful meal using only bits and pieces left over from the grocery shop the week before. Risottos are a fabulous way to combine bits and pieces in a cheap, easy and delicious meal. I love cooking risottos – I find it very therapeutic standing over the stove stirring- so this is a perfect one-pot, lazy, cheap thursday evening meal for two (with leftovers!). In a large, non-stick saucepan, heat the oil until fragrent and gently fry the onion, garlic and celery until transparent. Add the rice and stir to coat with the oil. Toast rice until just transparent – 2-3 mins at most. Add tomatos, dried herbs, red wine, balsamic vinegar and tuna and stir to combine. Fill a large jug with tap water. Add enough water to the risotto to just cover the rice – about 1/4 of a cup should be sufficient. Stir the risotto constantly, allowing the water to be absorbed before adding more. During this process, the liquids in the pot should be just simmering – adjust the heat as necessary to achieve this level of cooking. When the water has mostly evaporated, add more and repeat the stirring process. Keep doing this until the rice has swelled in size to approximately double, and is al-dente to the bite. Taste for seasoning – I normally find a little salt and a lot of pepper is needed to give the flavour I prefer. When the rice is al-dente, add the mushrooms and the peas and stir through. Continue to cook, adding more water as necessary, until the mushrooms are soft. Turn off the heat, stir through the fresh herbs and serve immediately with a little grated fresh parmesan on top. This recipe makes three very generous servings. Calories – quite a few!! Will calculate later – keep portion size to under 3/4 cup to be safe. For a cheap, lazy dinner, I suggest a cheap, lazy wine. The current release of Fishbone wines from Blackwood wines in south-west WA are excellent quaffers, at about AUD$13 per bottle. The 2005 shiraz/cab has everything you would want from a cheap, easy to drink red – plenty of fruit and spice and no nasty tannic aftertaste. The title should say it all really. This was a fabulous dinner, and so easy. I don’t normally like to cheat by using packaged sauces, but last night I just couldn’t be bothered, so picked up one of the new “Continental Flavour Base” satchels. The one I got was the Thai soy, ginger and tamarind. I wound up tweaking the flavour somewhat as I wanted to sweeten the meal to bring out the flavour of the prawns, but to be honest, it didn’t really need it. I will definitely be buying this sauce again, its one of the best ones I’ve tried to date. Heat a non-stick wok to high heat. Stir fry prawn in a smidge of vegetable oil for 1-2 mins or until the colour just turns. Quickly remove from heat and set aside. Stir fry the vegetables (excluding the bean shoots) for 2 mins or until just softened. Remove from heat and set aside. Add flavour base to the wok and simmer gently. Add sweet chilli, fresh chilli, lime juice and oyster sauce. Taste and adjust for sweetness/sour balance by adding extra sweet chilli or lime. Return prawns and veges to wok with bean sprouds and stir fry another 1-2 mins or until dish is heated through. Serve immediately over steamed white rice. Serves 2 as a main course, or would make a wonderful starter and could be stretched to 4 small serves over rice. Approximate calories per main course serve: prawns – 170; rice (1/2 cup) – 90. To reduce the calories in this dish, omit the rice or the sweet chilli sauce. To increase the calories and add some good fats add a handful of cashew nuts when serving. With this dish, I served a wonderful white wine from one of my favourite wineries in Margaret River: Watershed. The wine was a 2005 Unwooded Chardonnay and it was a perfect accompanyment to the prawns as it was just sweet enough to match the tamarind in the sauce, but still with a wonderful dry finish and plenty of body. It was also quite reasonably priced at $17 for the bottle. So I recently purchased this knife set. I’ll be honest, I got it primarily because I love how the knives and the block looks. But I have to say that after 2 months of using them, I am totally in love. They are SO sharp, they are dangerous! I never used to understand how professional chefs could slice their veges so finely, but now I get it. Great knives make all the difference to food prep, and although I can’t compare Global to any brand other than Mundail (which is what I had before the Globals), my instincts tell me that these babies will stand up against many of the better brands. The set has a RRP of something crazy like $600 Australian, but you can buy it online for $300 from homecouture (see link to the left). I actually got mine during the pre-christmas sales and paid only $260, which is incredible. 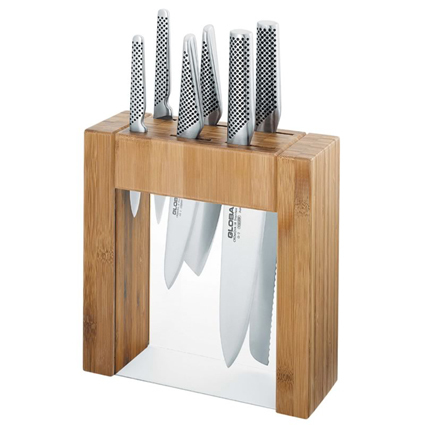 All in all, I highly recommend this knife set to wannabe chefs – as with all knife sets there are a couple of knives that get used only rarely and others which are my favs, but even so I think this set is a good all-round comprimise and gives you everything you need at a reasonable price:quality ratio. Made this recipe tonight. Absolutely wonderful. The recipe comes from the new cookbook by Donna Hay, called “Instant Entertaining”. I modified it a bit to strip down the amount of sugar used, and to bulk up the salad. Stir-fry the pork over very high heat in a smidge of sesame oil for 2 mins. Remove from wok, set to one side. Place ginger, chilli, soy, sugar, lime and fish sauce in wok, gently heat and stir to dissolve sugar. Taste for acidity/sweetness balance, and add extra lime juice or sugar according to taste. Add pork back into pan and simmer 1-2 mins. Combine salad ingredients in a big bowl. Serve pork on top of the salad. If desired, serve with a side of steamed white rice. Serves 2 as a main course. Approximate calories per serve: pork – 270; salad – 50. To decrease the calories in this dish, stretch the pork to 3 serves and serve extra salad, or alternately, substitute the sugar for splenda. To increase the calories, serve 1/2 a cup of steamed white rice on the side, or under the salad if serving in a bowl. I served this dish with beer rather than wine as the spice of the pork balances beautifully with the crispness of beer. My choice of beer was Beez Neez, a honey wheat beer brewed by Matilda Bay brewing company which originates in my home town of Perth. It would work equally well with a crisp, dry white wine such as a riesling. OK so I don’t normally love her, but what is not to love about how she looked at last night’s Grammy red carpet appearance? She looks slender and gorgeous and that dress is to die for!! Apparently its Dolce and Gabbana, which sounds about right to me. Combine the pesto with the yoghurt and stir through the chicken. Leave to marinate for 30 mins to 4 hours (optional). Cook the chicken in a very hot non-stick frying pan, wok, or on a grill (BBQ is best) until just cooked through – approximately 3-4 mins. Set to one side. Combine the salad ingredients in a large bowl. Sprinkle garlic on top. Squeeze over the juice of half a lemon (important to coat the avocado so it doesn’t go brown) and then add olive oil and vinegar. Toss well. Season with salt and cracked black pepper to taste and if desired add more oil or vinegar to balance the acidity to your liking. Place the chicken pieces ontop of the salad and serve. This dish serves 2 as a main course or could be served as a side dish or a starter. Approx calories as a main are: chicken (120); salad (200). To reduce the calories in this dish omit the avocado and substitue with diced green capsicum (bell pepper). To increase the calories and really make this dish something special, add 1/4 cup of shelled pistachios. I served this dish with a full-bodied red wine: 2004 Three Hills sangiovese. This wine was a good, but not great accompaniment to the salad. If anything, the alcohol and fruit in the wine overpowered the gentle flavours of the dish, but the robustness of the wine went nicely with the theme of the salad. I should have decanted this wine, but foolishly didn’t.